I blogged your contest here. What a cool contest. My husband has an iPod but I do not and would love one but haven’t been able to justify treating myself! This is my post for this contest. Thanks! enter me, I linked up! I entry your contest at my journal. Happy blogaversary! I’m linked up to your contest. @ Qtpies7 A url is required so I can find your contest post. I am linked up here! I subscribed to your feed, great content! I don’t know why I just subscribed now. I wrote a little post about this here. Seems like a cool site and way to win an iPod so I’m all for it. Here’s my blogpost of your site and contest. I would love to have an ipod. I just had my 2nd baby so this would inspire me to get to the gym…or at least make it more fun! Thanks for the contest! You’re all linked up in my weekly contest review. I’ve linked up at http://www.blogger.com/blizzardbreath and also at 2 other blogs that are by invitation only so I can’t provide the link for them. So exciting to be a part of this contest! I would love a new ipod. Yay! 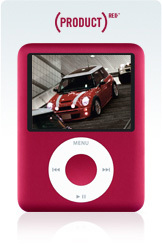 Red is a cool color for an iPod Nano! I can’t find your RSS email subscription! I finally got around to putting my blog back up and I posted about your site and contest. great contest , happy to be part of it , will be more happy if i am the winner.